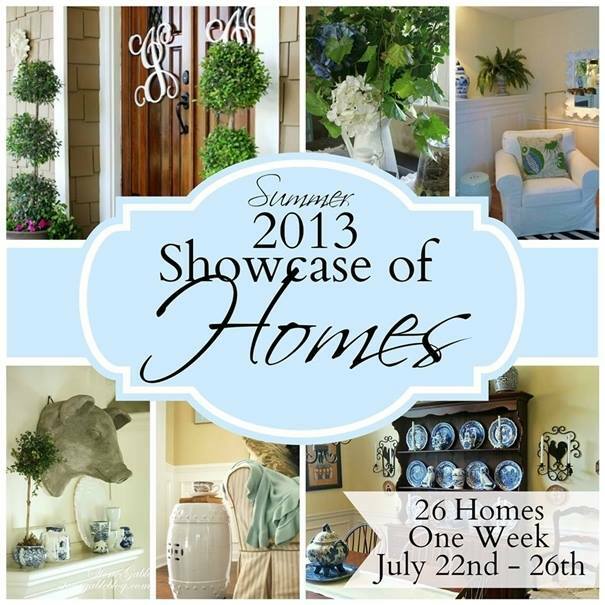 2013 Summer Showcase of Homes? Oh my goodness, it reminds me of my House Snoopers series that takes place here every Friday. Except it’s twenty-six homes all in one week instead of just one! 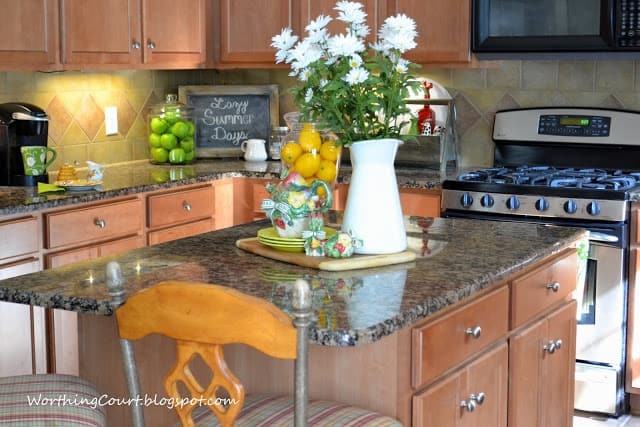 I’m honored to be included in this incredible group of bloggers who are showcasing their homes. Settle back ’cause this is the a picture heavy tour! We moved into our home seven years ago. I love our neighborhood – great neighbors, lots of kiddos playing outside and a really convenient location. It’s two stories tall with a full basement, so there’s lots of room to spread out in. We’re empty nesters, but I take care of two of my granddaughters during the day so we actually wind up using nearly every square inch of the house. 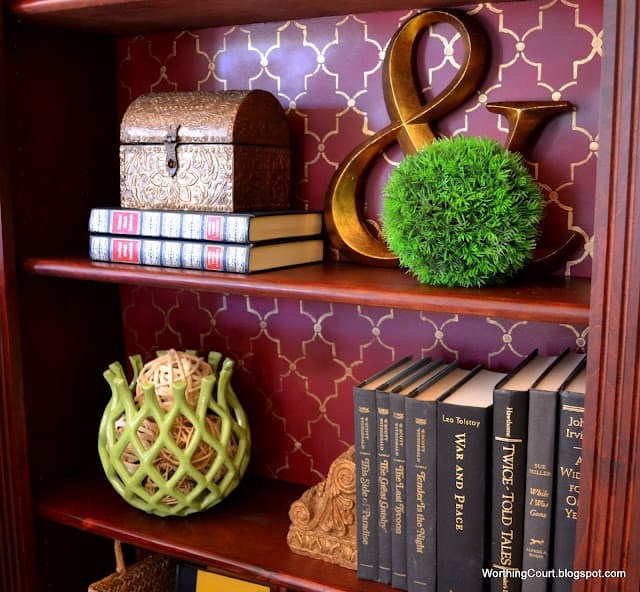 As you tour my home, you’ll quickly see that I love color, pattern, texture and different styles all combined together. 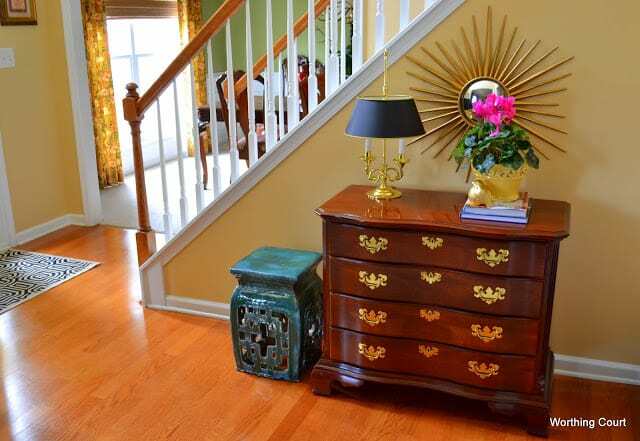 In my foyer I’ve mixed a combination of the traditional furnishings that I already own with a few vintage pieces and a few new pieces. It gives me an eclectic look that I love. This is only a small piece of the area, so click here to see the whole space. You can see that my dining room is located just off of the foyer. 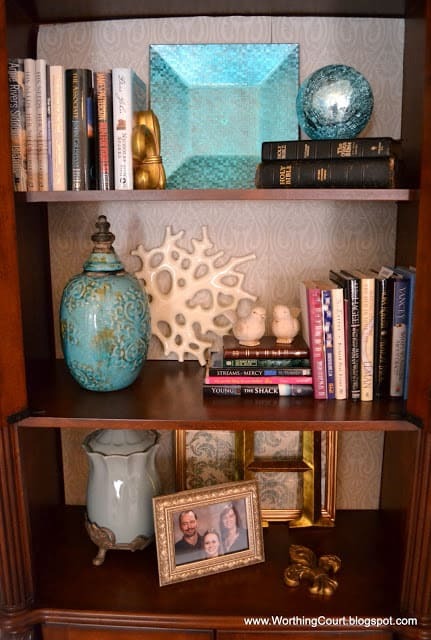 I applied my same method of mixing existing furnishings with vintage and new accessories. Part of the process was transforming my boring brown chandelier with paint and replacing the traditional shades with fun round bulbs. 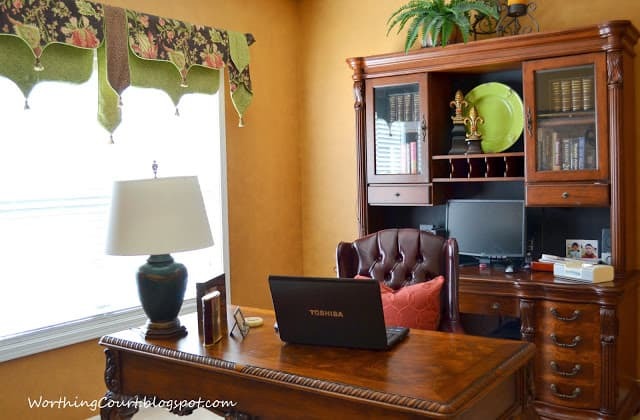 Check out the before and after of the chandy and the entire room here. 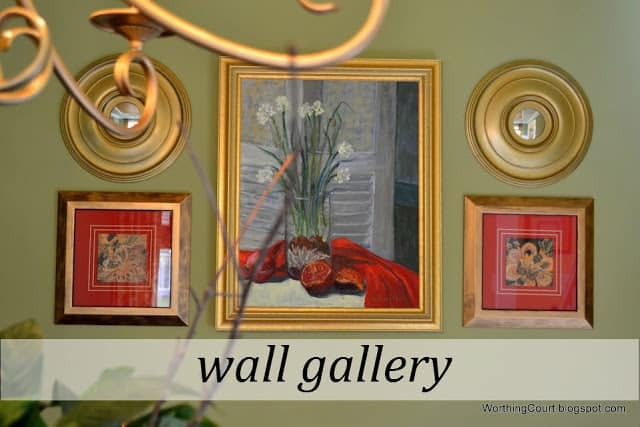 A popular project that I completed for my gallery wall was making my own convex mirrors. 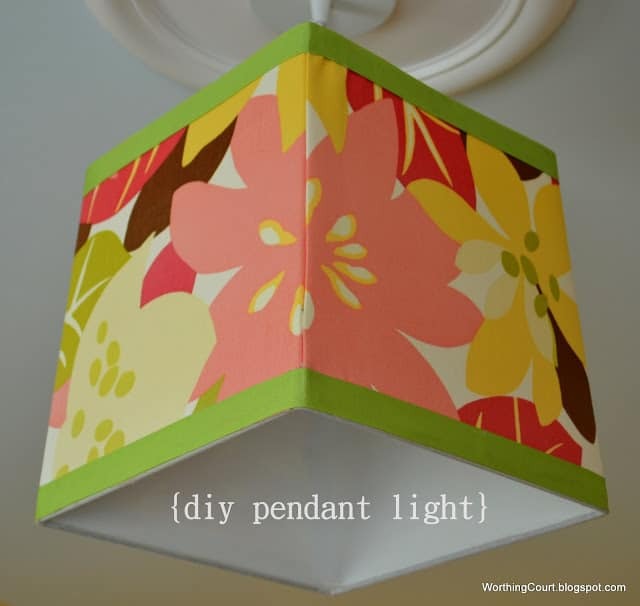 They’re pretty pricey to purchase ready-made, but my version is easy and cheap and you can make them any color that you want. Click here for the tutorial. 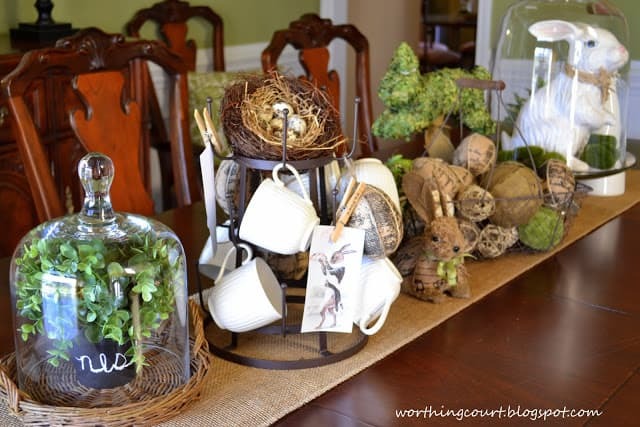 The dining room is one of my fave places to decorate for the different seasons and holidays. I recently put together a vintage Americana vignette for July 4th, but one of my favorites seasonal decorations was the centerpiece that I put together this past Easter. The living room is located on the opposite side of the foyer and I would say is the least used room in the whole house. We just aren’t living room people, y’all. Click here to see the entire space. The living room is another space where I put my existing+vintage+new formula to work. There were several projects in this room. I made several pillows in a mix of patterns to try to distract the eye from my less-than-desirable-and-dated furniture. I revamped the bookcases by stenciling foam core for the back and getting rid of a lot of the heavy look. Click here to see the before and after. 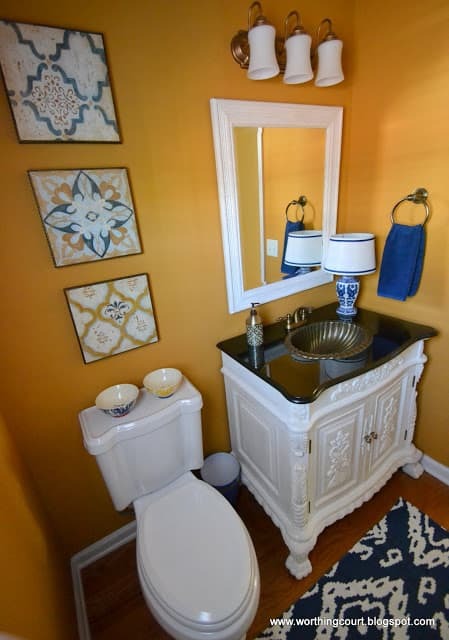 To lighten and freshen up my powder room, I painted the dark vanity, changed out the artwork and replaced the drapery window treatment with an upholstered cornice that I made. This bright and happy fabric was my inspiration for the entire color palette in this room. I operate a custom drapery workroom out of my basement, so it’s only natural that my decorating process usually starts with fabric of some kind. 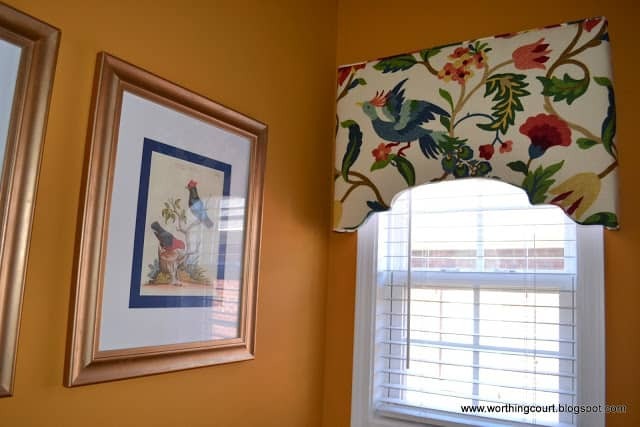 Click here to see the entire hard-to-photograph space and here to see the complete tutorial for how to make your own upholstered cornice. The most hardworking space in our home is the family room and kitchen. These two rooms are open to one another and function perfectly for us. Although I’ve made several changes in this room, you can click here for the original full tour. 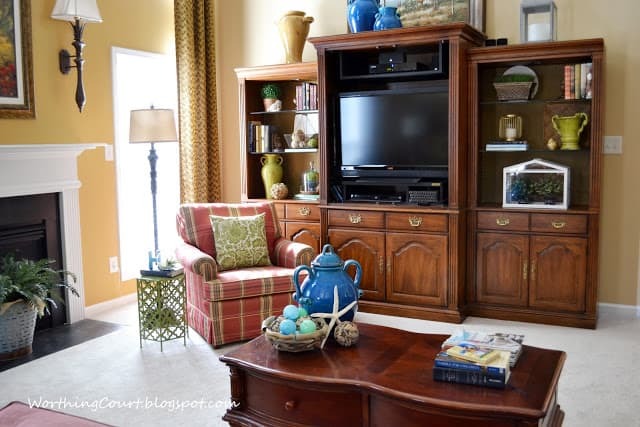 I recently did a makeover on our entertainment center and am so happy with the lighter and more colorful look. Click here for a closer look and the before and after. Click here for a full tour of the room. My laundry room is yet another colorful space and is located right off of the kitchen. Boy, do I wish this was located upstairs where all of the bedrooms are! Click here for the full tour. I get lots of questions about our laundry room sink. You can read all about our solution for getting rid of the original el-cheapo laundry sink and replacing it with an affordable, more custom version by clicking here. The last room on the main floor is the office – the room that is screaming for a do-over. Hopefully, I’ll get to that sometime in 2014, but here’s how it looks for now. Click here to take the full tour. We’ve already switched out the original massive desk, but you’ll get a better feel for the room. All of the bedrooms in our house are located upstairs. 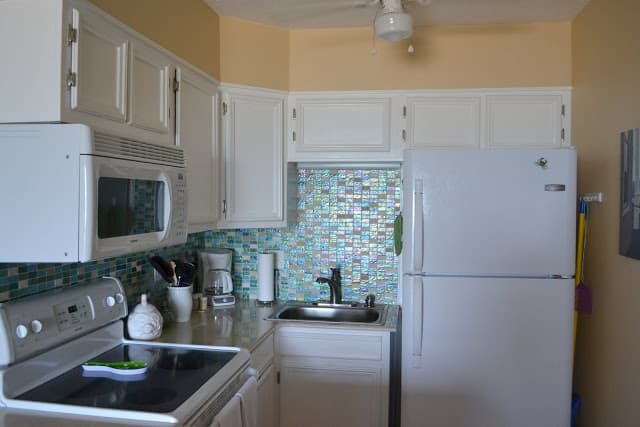 There are four bedrooms and three bathrooms. Remember I mentioned that I keep my granddaughters during the day? 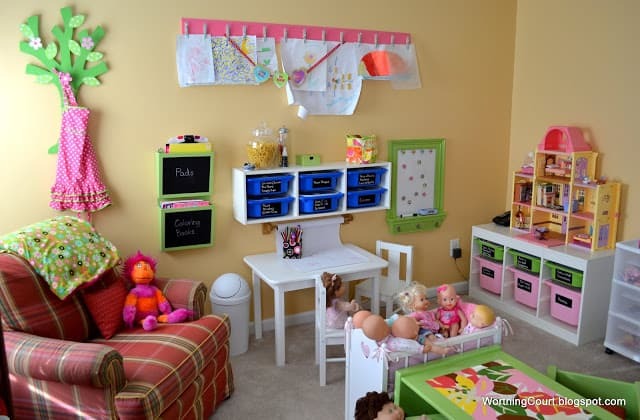 I took one of the bedrooms and turned it into a playroom for them. It’s rarely this straightened up. Even as I’m writing this, you can hardly find an open bit of carpet on the floor to step on. It’s a fun, bright and cheery space that was inspired by yet another fabric that I fell in love with. There are several diy projects in here. Click here to read more about them and to take the full tour. 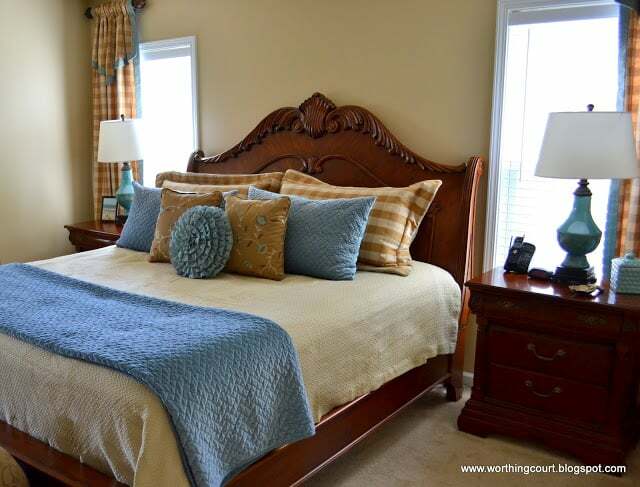 Our master bedroom was the very first project that I used to kick off Worthing Court a little over two years ago. 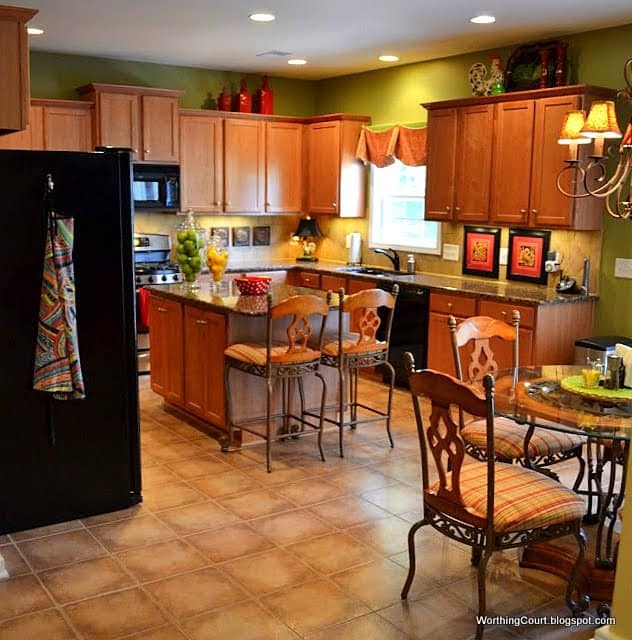 It’s a generously sized space and you can take the full tour by clicking here. 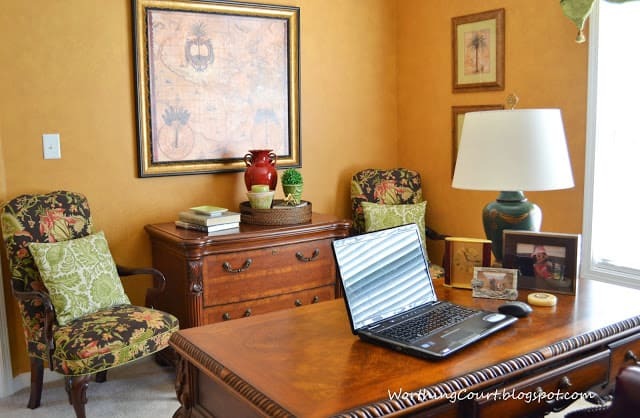 There were lots of projects in this room, including coming up with inexpensive artwork to fill a huge thorn-in-my-side wall, revamping the bookcases, making draperies, making a box pleated tablecloth for the decorator table and making lots of pillows. 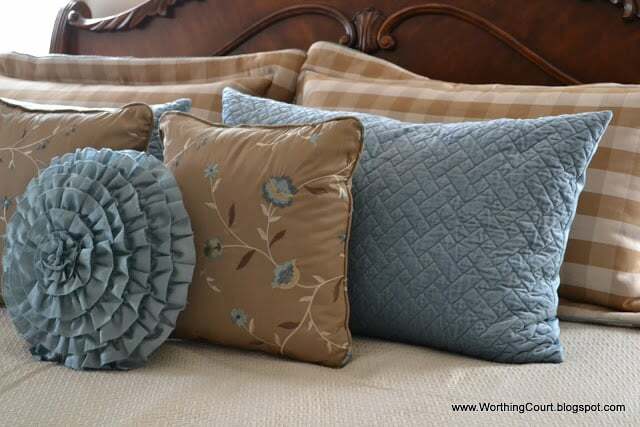 I have a full tutorial for how to make a pillow sham here. One of the first rooms to come together after we moved in was this guest room. It was quick and easy because I used bedding, lamps, art and accessories that I already had. All I had to do was paint! Click here to take the full tour. I’m right smack in the middle of updating the last bedroom. I’ve completed the bedding and draperies. I’ve added some artwork and even found the perfect nightstand after soliciting advice from all of you. I have a couple of more projects to do before the final reveal. When we bought our house, the basement wasn’t finished. Pookie (that would be my hubby) spent weeks and weeks turning it into a finished space. I think he did an awesome job and I’m so proud of him! I have my drapery workroom down there in a partially finished space. It’s a space that was put together exclusively for me! It isn’t meant to be pretty, but it’s one of my favorite places to spend time in. Maybe those of you who are seamstresses or crafters can relate. Other than my workroom, the rest of the basement contains a kitchenette, a pool table room, a workout room, a full bathroom and a media/family room. Once the basement was fully finished, it kind of became a dumping ground for all of the leftover furniture and other stuff. You know how that goes. Well…I got tired of that and decided to start working on the rooms one at a time. I started in the media/family room and love how it is turning out. I’m going for a rustic/vintage/industrial vibe. It’s sooo much better than it was. I have one more side of the room to complete and then I’ll be doing the full reveal. So far, there have been quite a few diy projects. Like, how to make new wood look like old barnwood, repurposing a vintage mantle, turning a wicker cloche into a lamp and repurposing bifold doors/shutters. The rest of the basement is far from photo-worthy, so I won’t bore you with any of that. We also have a teensy-tiny home away from home condo on one of the beaches here in North Carolina. Click here for the full tour. You won’t believe what we started with! I really enjoyed sharing my home with you. Thank you for coming by! 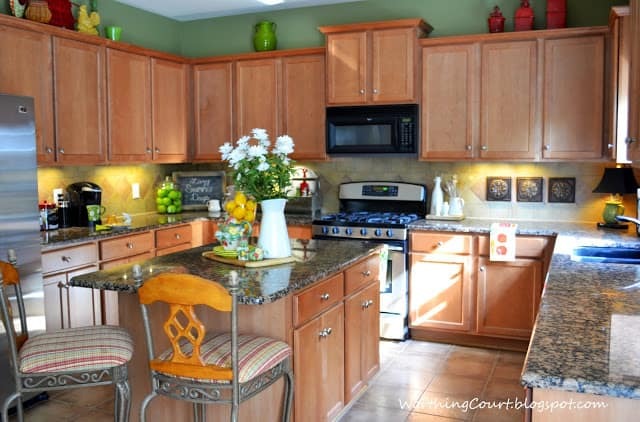 You don’t want to miss the rest of the homes on today’s tour. And in case you missed any of it, I’m sure you’ll want to go back and see the tours that took place on Monday, Tuesday and Wednesday. And coming up on Friday. It’s all fabulous!! Everything! 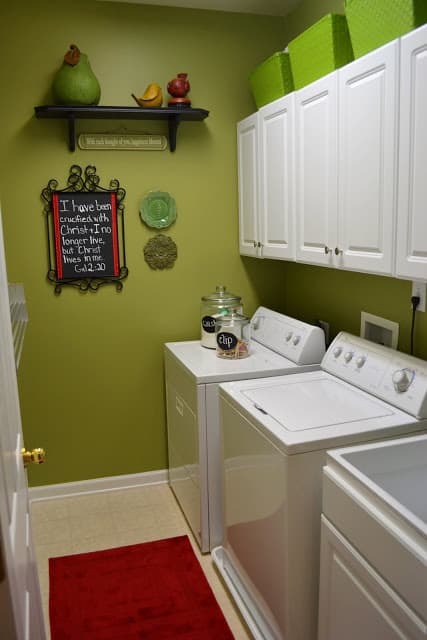 Love that green that you’ve got going on in your laundry room and that sweet playroom!! 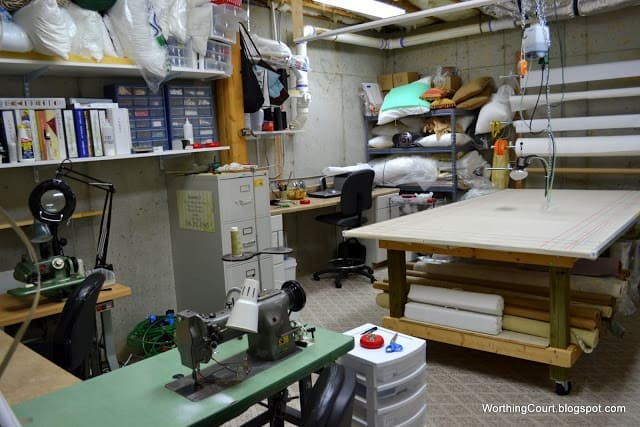 I had no idea that you had such an extensive workroom. you are quite the talented seamstress. Your home is beautiful! Loved this tour so much. I can say I have seen your home in person. Looking good and can’t wait for the finished reveals. I love all of the colors in your home. Warm and welcoming. Thank you for sharing your home today! Suzy, I enjoyed seeing your home in its entirety today. It is so warm and welcoming and filled with beautiful colors! I had forgotten about that playroom that you created but it is simply amazing. 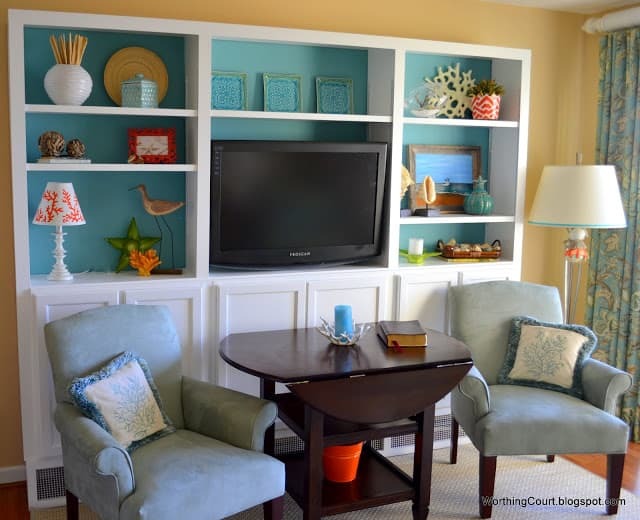 I’m going to steal your idea about stenciling foam board to solve a little problem in our media cabinet. It’s time to hide the wires! Thanks for the tour of your beautiful home. Love your colors. Suzy, I have to say I was smiling all the way throughout your tour! 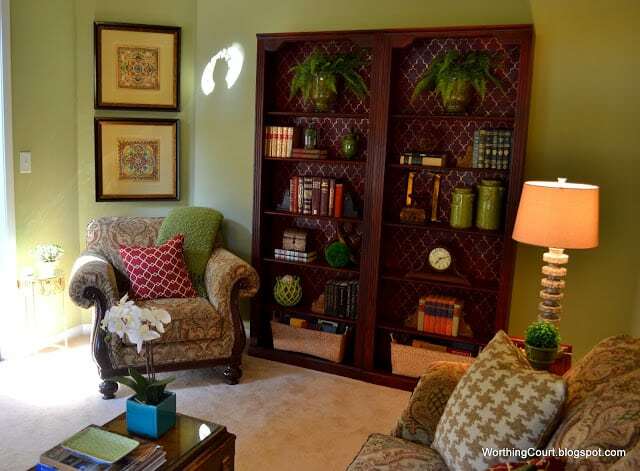 You use of bright colors makes your home a warm and happy place, I can tell you have put a great deal of thought into the whole process of decorating and I felt I got to know you a little better by being in your home,(virtually) You do an amazing job styling all of your bookshelves in your rooms. Very impressed!! Such a fun day being in the tour with you today!! 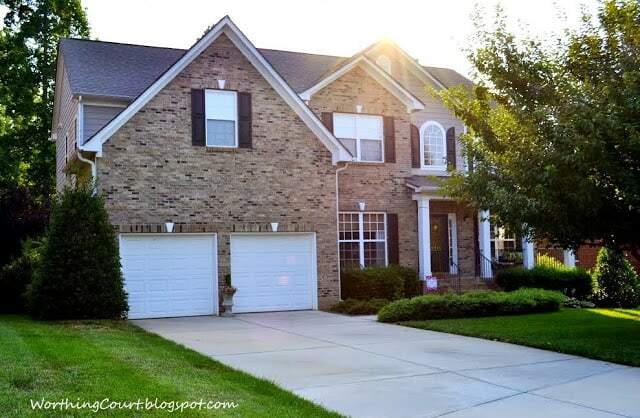 Your home is stunning, Suzy! I love the colors everywhere and the way you mix and match accessories. Your space is enormous but it still feels like home. Totally envious of all the space you have! Next time I visit I’m taking the whole tour, clean or not! You did a standout job on this post. Kudos! What a home!!!! Suzy, you home is the epitome of warmth and southern charm. I have always wanted my home to look “done”. Your’s does and that is the highest compliment I can give. Every room is perfection… and you have a BIG house!!! What a joy to visit your home! Now it’s time to meet you! See you in one week!!! I like your use of color and found it very interesting. I rarely buy decorating magazines any more or any magazine for that matter, due to the high cost of them, but I was looking over the few that I got in the last months and realized all of them were due to looking at rooms / homes using alot of color, one being green, in shades such as yours. 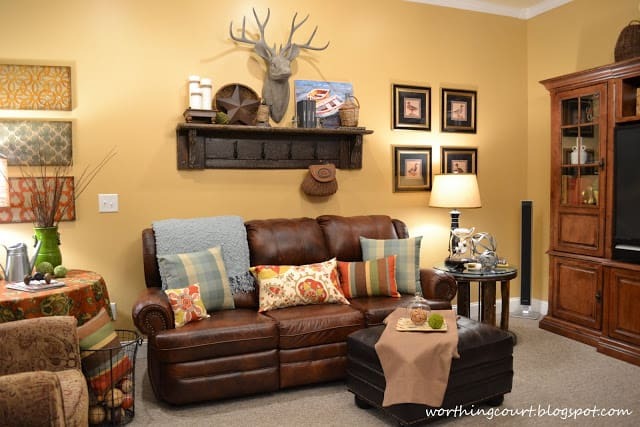 I was not going to run out and paint but keep thinking about it…change the window trim paint? Make colorful curtains? Make a bunch of pillows ? All of the home tours thus far are lovely but yours is the first one that had the look that I found myself attracted to in the magazines. 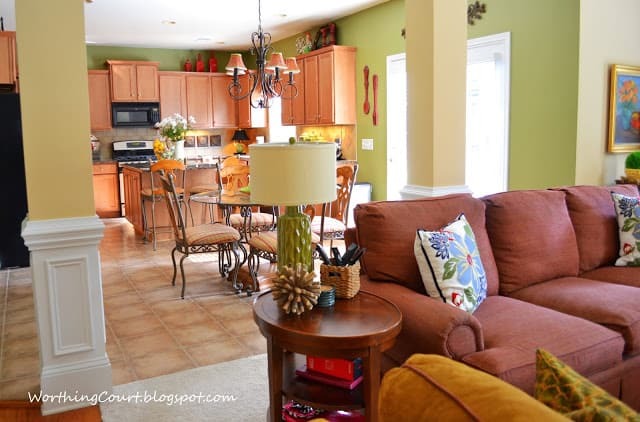 I love your beautiful, colorful home Suzy! 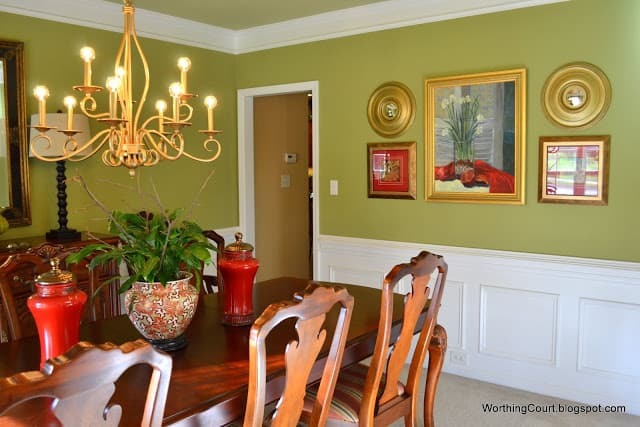 It looks like we share a love of bright cheerful color, especial apple green! 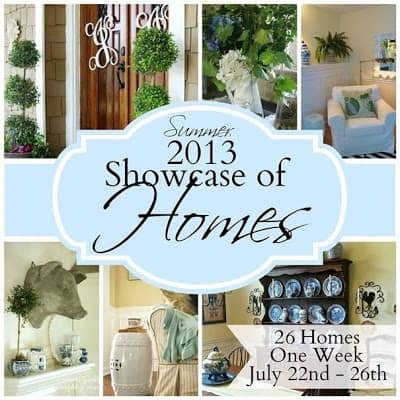 Your home tour is fabulous! I love your choices of color! 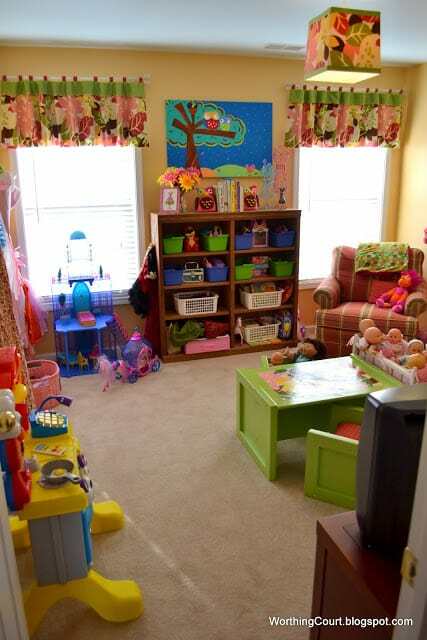 What a marvelous playroom and workroom- fun places! Thank you for sharing your warm and inviting home your with us! What a wonderful use of colour Suzy! The way they flowed… luv it! Thanks for having us. There are so many great things about your home. I love how you did the rear of the different bookcases and I love the white vanity sink in the bathroom, and you bedroom is amazing. BUT what I really like is your creation space. I think Where Women Create would love to see that space! Thanks for sharing. Suzy your home is just so beautiful…and with having the pleasure of actually being in your home, I can say that it is more beautiful in person!! 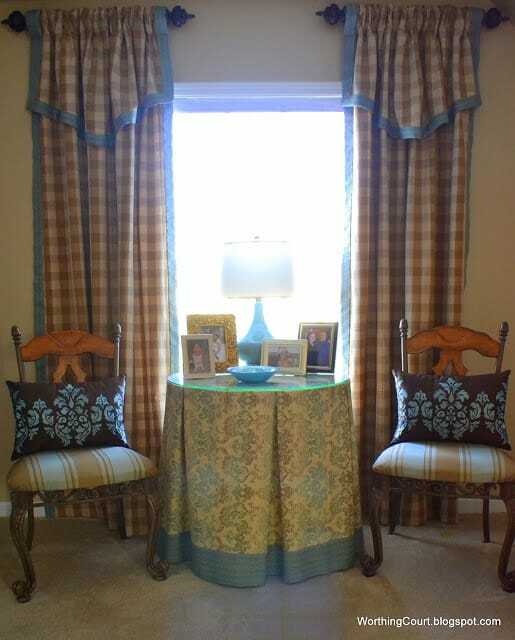 !…Your sewing talents are like a shining star in your decor…your home is definitely so warm and inviting like the owners!!!! Wonderful tour Suzy! I always love seeing your home Suzy. That workspace of yours is amazing. It must be so wonderful to be able to sew and have the talent that you have. I can’t sew a thing. I always love seeing that cornice that you made in the powder room. Seriously… when can I stay in your beach condo? FABULOUS!! I’m beyond jealous that you have such a HUGE basement, or ANY basement for that matter!! I LOVE it!!! You have so many wonderful spaces I just don’t know where to start! Plus, I love all of the color on the walls!! I am such a wall color person!! LOVE!!! omgoodness Suzi, what a beautiful home! and that basement is to die for, I would give anything for a basement! Great job! 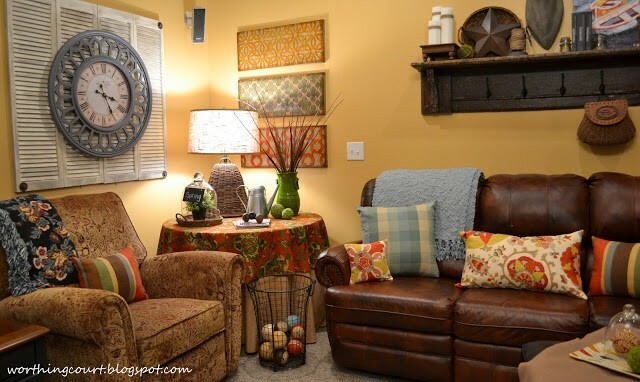 Hi Suzie, I love a good snoop….beautiful home…….Christine from Little Brags..
What a lovely home! You really have an eye for eclectic style and pull it off beautifully 🙂 Thank you for the tour! What a fun tour Suzy! I love your workshop and every room is beautiful. You are so talented! 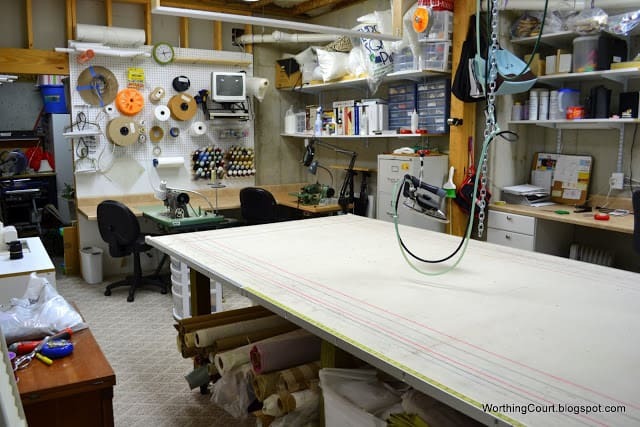 I officially have workroom envy now! LOL. 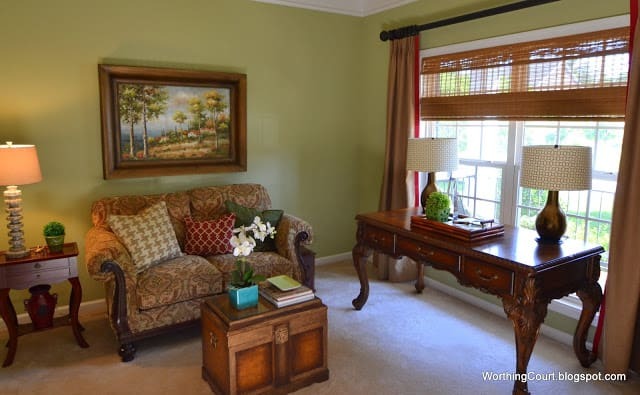 Love the color of green on the walls in your living room. I’ve noticed green is becoming quite popular in home decor. Thanks for sharing your exquisite home with us. Your style and personality shine through in every room! Love the green walls in your laundry room. 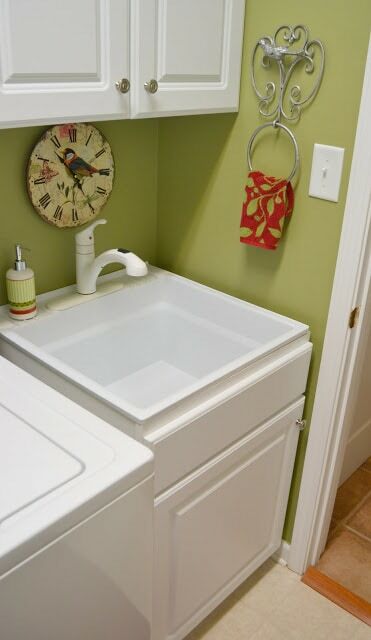 I’ve been thinking of painting my laundry room almost that shame color of green (my favorite color), since my husband would never go with that much color in any other room of our home. LOL. Ah! Just gorgeous! I love all the color in your home. 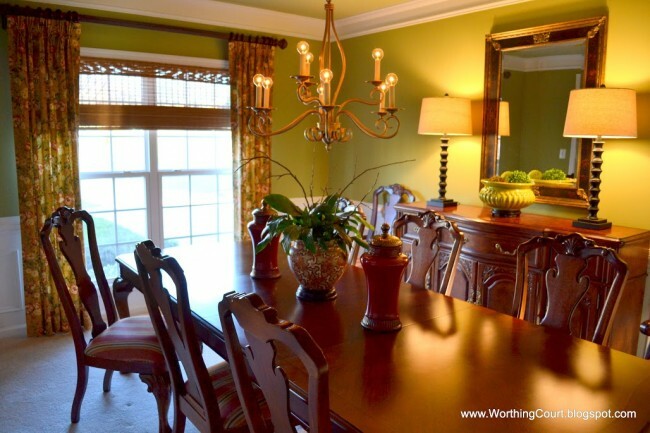 Your golds are beautiful and you have found the perfect apple green in the dining room. I even love the bedroom shade too. Your accents are fabulous as well. Beautiful home! Thanks for sharing! Wonderful tour, Suzy! It was so much fun seeing your home in its entirety. Great tour, Suzy! It’s always fun to see your home and the different things you’ve done. 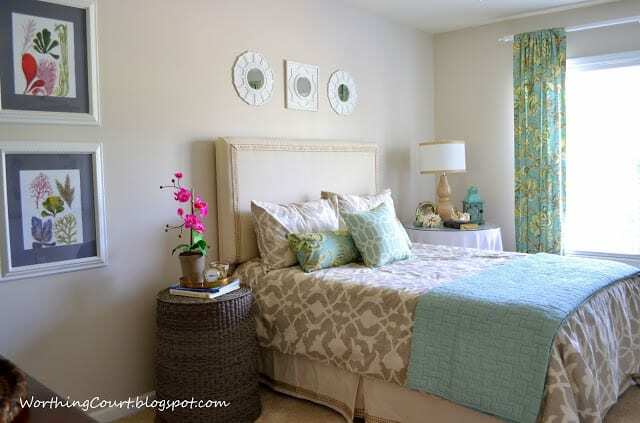 Soo pretty~ love your home and all the charm you have created in your rooms. What a fantastic play room too!! Beautiful home, Suzy. Thanks for the tour! You go girl! Everything so fresh and fun! I love your window treatments! Can’t wait to see you at Haven! Your home awsy from home is adorable! Thanks for sharing your lovely home with us. 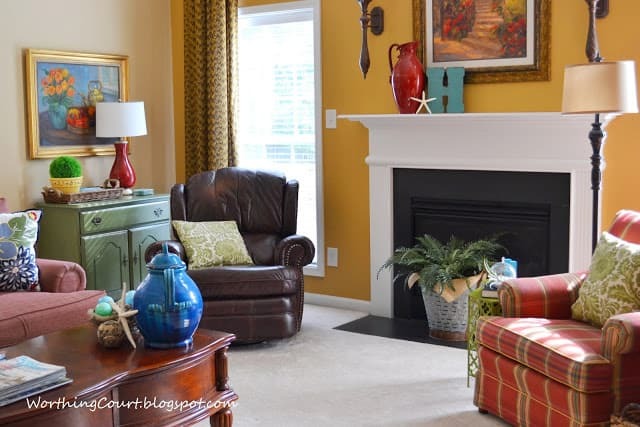 You know I love your home, Suzy, especially because your color palette is one of my faves! I love the new artwork in your bath … your granddaughters’ playroom is adorable (lucky gals) … and, I *want* that gorgeous starburst mirror in your entry! So pretty! I love your home and the DIY shade is so cute! Oh GF, where to start….I love so many of your spaces!!! 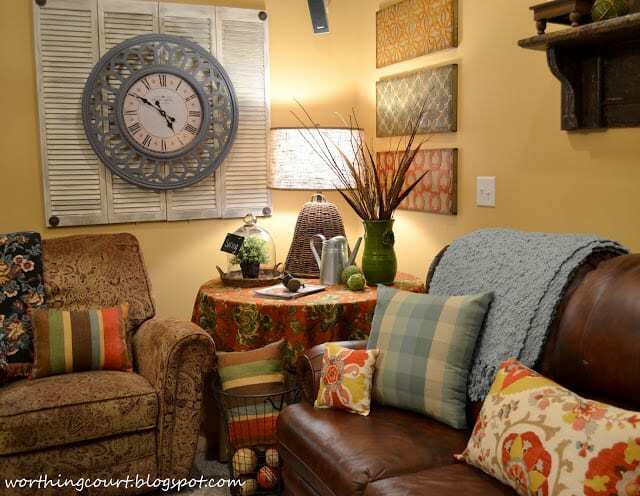 Hard to narrow it down, but I think my favorite of your DIY spaces are the bookshelves at the beach condo, the playroom any child would love, your amazing workroom, ALL your window treatments, love your greens and reds especially at Christmas, the colorful laundry room….and I could go on and on. I’m especially glad I can enjoy all these things in person!!! LOVE all the color throughout your home. 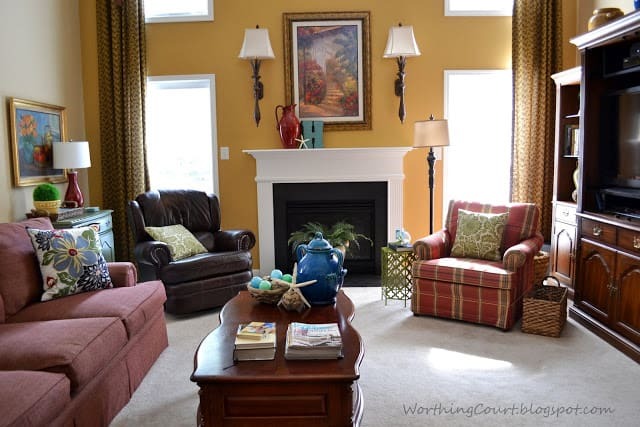 I’m especially loving your family room and the way you combined fabrics in there. Just wonderful! By the way, where did you get all of your mounted animal heads? I’ve been looking for some just like those. Gorgeous home! I love your style, it’s very much mine except my home is not as beautifully done as yours 🙂 I have the vision but not always the pocket. I just found you via confessions of a plate addict. Huh, so ironic that we are traveling from MI to NC today for a week’s vacation! Love the window treatment in the office!!!!! !